Exactly the same spot. Here is a screenshot from my recording. I was at the NWAF with Ivan Pavlov (Artyom Malikov), and we were looting the northern barracks together. We had been there for about 10 minutes when I heard a silenced shot. Ivan immediately said he was dead, and he at first thought it was a game bug, but I knew it wasn't. I started looking for the possible killer, and some moments after Ivan's death, I spotted a guy creeping around on the woods near the complex, and he didn't shoot me, so I didn't shoot him either. I lost visual on the guy, so I started to fall back, since I had no idea what was happening. When I started moving east, someone started shooting at me (also a silenced weapon) and he tried to hit me a lot of times, and actually hit me once. I kept falling back till it felt safe. No initiation was ever heard. I was recording the whole time. And I can upload the video later on since I don't have the editor to render the video installed on my computer at the moment, and the file is quite big. Had some RP with I believe @Erik, @jahneephive01, @Ivan Pavlov, @Mikoyan Rykov and plenty of others, but I can't tag them here because I don't know their names...anyway, the second part has some cinematic style to it in the end, I thought it was pretty cool to add...it was fun! Cherno - The smaller triangle? Happened to me and @Mikoyan Rykov the other day...followed by a very weird graphic glitch which was honestly brilliant. S1 and S2 lagging and changing the game graphics? Ouch Peps, seeing you don't care makes me wonder what's the deal with the free insult over my intelligence, are you just an agressive person overall? Yuri Menshikov is a young chernarussian man, born in Chernogorsk. He studied all his life in the city, and when he finished his last year of High School, he found himself joining the Chernarussian army, to complete a 1 year long military service. His family didn't have a lot of money, so they could use Yuri's help with the salary he got from the Army. This opportunity showcased the young man's passion for the life of duty, and his abbility to use firearms, which was his favourite activity while serving. He had just finished his military service, and having plans to join the Military Academy, life seemed to be smiling back at Yuri, when all hell broke loose. On October 22nd, the infection reached Chernogorsk. Yuri was camping with some friends on the woods, and when they went back to Cherno they were shocked. The chaos on the streets made the man hurry to his parents home, which was empty when he got there. He never saw them again. His search continued as he travelled all around the coast, looking for any sign of his family or friends. 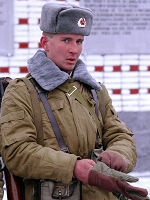 The search was not succesful, for the most part, but he did manage to find one of his brothers in arms, Nikolay Belyaev, a fellow comrade from the Chernarussian Army, now the two struggle to survive as they keep their hopes on finding some family or relative. Yuri is not quite the good guy, but he isn't evil either. Not taking any steps backwards, he is willing to do what it takes for his survival and the survival of any friends he may encounter. As a young man, he's has an unpredictable behaviour, and can be a dangerous chernarussian patriot to any outsider trying to occupy his beloved country. Most of the times, Yuri doesn't really care about most survivors, although, he's an impetuous young adult and that feature increased during the harsh military training. Heave ho, S-GRU OGs, never shall we die.. Yo, ho haul together, hoist the colours high!